and a barbeque space beside it. Now look who is ready for dinner.
. Tanuki　狸 Badger amulets and toys . (1558 - October 8, 1594) was a semi-legendary Japanese outlaw hero who stole gold and valuables and gave them to the poor. 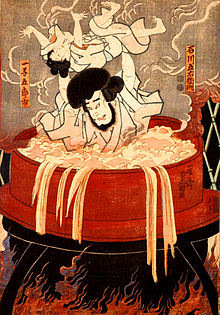 Goemon is notable for being boiled alive along with his son in public after a failed assassination attempt on the civil war-era warlord Toyotomi Hideyoshi. 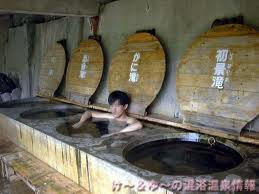 A large iron kettle-shaped bathtub is now called a goemonburo ("Goemon bath"). His legend continues to live on, often with greatly exaggerated ninja skills, in contemporary Japanese popular culture. 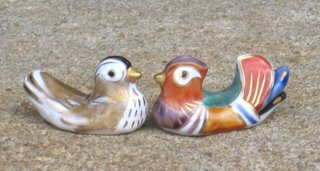 We have a goemonburo in our garden too. hi Gabi... I had to look! Cooking a cat indeed :) A saki drinking cat! Bernd san makes everything cleverly, doesn’t he? Overlooking a far mountain range, how is the bath, Haiku kun? of bathtub just like he getting in. Your photos stirred my nostalgia softly. Thank you very much, Gabi san! Lovely photos, lovely story, Gabi san! Wish I were there to enjoy haiku and haiku kun and perhaps even a barbecue -- and OF COURSE the outdoor bath! "our cat is a constant SAUCE of joy and pleasure..."